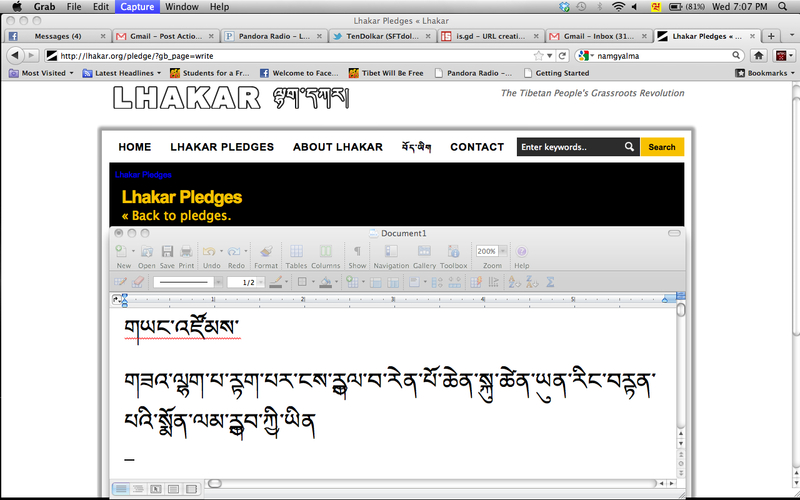 Yes, it did take me close to an hour trying to write/type one sentence in Tibetan on my laptop. It’s not the most glamorous or exciting of the Lhakar actions, but it was definitely the most grueling! Before you judge me, try typing Tibetan with an English language keyboard with a 4 grade Tibetan language reading & writing background and then report back! To tell you the truth, I didn’t even compose the sentence. All I’m doing is rewriting it from a hard paper copy and typing it into Lhakar.org. Here’s the story: Just about a week ago, I met 4 of the former Drapchi nuns & political prisoner at SFT’s Free Tibet! Action Camp XIII in Germany. Phuntsok Nyidron la, Gyaltsen Drolkar la, Yangzom la, Choedon la, and Sangmo la had come from Brussels, Belgium to come as guest speakers as well as volunteers (bless their hearts!). One of the evening programs was about the Lhakar movement and I was there to help translate for them. So later on that night, they wrote their own Lhakar pledges on pieces of paper and asked me put it up on Lhakar.org. And so, here I am, putting it up. Yangzom la wrote her pledge in Tibetan in the Chouk form (pretty much the casual-chicken scratch-equivalent of the English writing style) and I never learned it, being that I left India when I was in 4th grade and they taught Chouk in the 5th grade. So, I missed that train. So, I had Tendor help me translate it from Chouk to the OuChan form (the formal, equivalent to the type font). And you the rest of the story. Here’s what I learned today: Practice! Practice! Practice! Speaking Tibetan is one thing, reading & writing is a whole new universe, especially on a laptop. So, I am definitely going to be practicing writing Tibetan (culmination of speaking & ability to read) more!